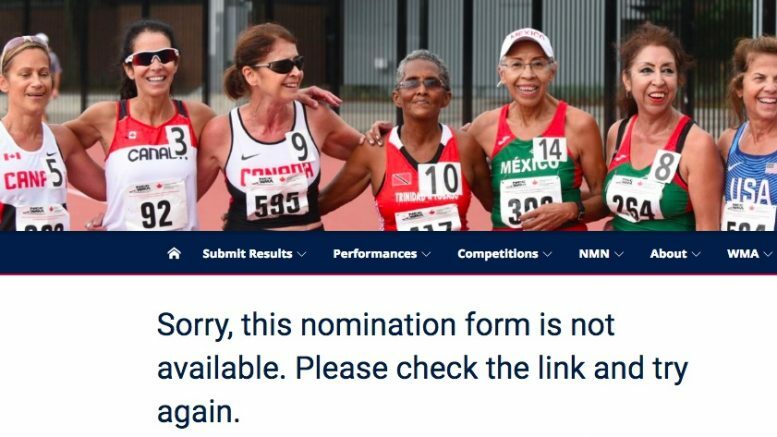 Here's what you get when you click "Nominate now" on the USATF masters awards promotion page. Not too helpful. The USATF Masters Awards panel, chaired by W40 Malaga worlds hep champion Rachel Guest, is doing a good thing — using our official USATF masters site to invite nominations for annual awards. But not so good — you can’t nominate someone. The specified page says: “Sorry, this nomination form is not available.” That’s an easy fix (I hope). But the deadline is Friday. Also revealed: “Each year, we recognize athletes that have achieved exemplary results on the track and in the field. In 2018 the USATF Masters Awards Sub-Committee have made changes to the awards program to align with the current WMA awards format.” That’s clear as mud, but maybe someone will post a comment and explain. In the past, the committee chose athletes in wide age ranges — men 30-49, women 60-74, for example. (See example from 2013.) Also in the past (at least 15 years), I was a member of the committee. I no longer am, for reasons I won’t discuss publicly, so I have no clue what’s happening on conference calls or message boards. But “aligning with WMA” is scary. Say what? Allowing WMA to dictate USATF policies? Do we let the United Nations dictate our policies on Israel? That’s un-American! And who in WMA is making us “align”? Is Canada aligning its awards process, too? Don’t get me started. So cross your fingers the process isn’t GIGO. A good start would be fixing the nomination page link. 3 Comments on "Nominate masters for USATF awards by Friday — if link comes back from dead"
Hi everyone! I would like to add that if you wanted detail regarding the current awards program you can find it here. http://usatfmasters.org/wp/2018/06/awards-subcommittee/ You can also go directly to usatfmasters.org and click on “For Athletes”. Scroll down to Awards and click on the green “Read More” link. You can then read up on all the awards available and click on the awards sub-committee link to get additional information. Feel free to contact me directly if you ever have questions regarding the USATF Masters Awards. Didn’t work late last night.